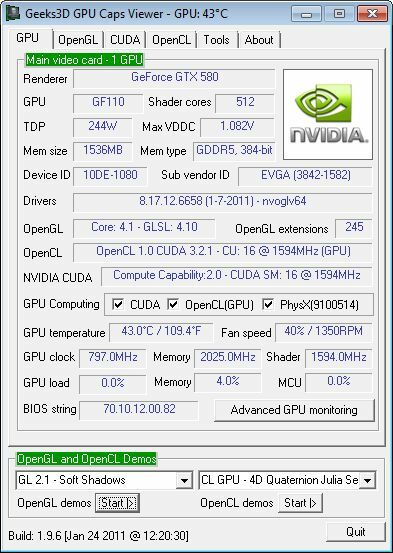 GPU Caps Viewer 1.9.6 adds the support of the very upcoming GeForce GTX 560 Ti. For NVIDIA cards, I also added the memory bus width in the memoty type field. And good news, all OpenGL 2 demos work now correclty with latest graphics drivers from NVIDIA and AMD (a simple recompilation of the 3D engine has been enough…). New: added support of NVIDIA GeForce GTX 560 Ti. New: for NVIDIA cards, added the memory bus width. Bugfix: now OpenGL 2.x demos work properly with latest graphics drivers. Reports the Mobility Radeon HD5650 as 360 cores instead of 400 (same with GPU shark which has always shown 360). Was fine in previous releases. No OpenCL support showing with HD6870. This has to be wrong, isn’t it? @Joe: you have to install the APP version of Catalyst driver to have OpenCL on your HD 6870.